For almost four weeks now I haven’t used moisturizer. My skincare routine involves an exfoliating cleanser with glycolic acid (gasp! – never thought I’d be able to use this during the height of my perioral dermatitis outbreak days) and a serum, which I rotate among a few different kinds nightly. That’s it, and my skin is looking good – real good. If you’ve read my blog posts on my personal dermatitis struggles, you’re probably shocked that (a) I’m not using moisturizer, (b) I’m using strong acids and (c) all it takes to keep my skin looking good is one serum at night. My perioral dermatitis is still there, still slightly red, but the inflammation bumps are gone. There are no breakouts and its basically 95% reduced. Though dermatologists say PD is an incurable skin disease, I’ve been able to nearly eradicate it for myself. Granted it’s been a long journey. First, I needed to quit over exfoliating my skin and weakening my skin barrier, then I needed to actually strengthen the skin barrier. But once those were done, this third and final phase of healing my perioral dermatitis has been all about paring back my routine. Do I really need moisturizer? The short answer I discovered is – no, not really. The past couple of months an interesting conversation about nixing moisturizer came up for me in two different doctor’s offices; the first was at my new dermatologist’s office, Dr. Parrish Sadeghi, and the second was at Skin Specifics run by founder and nurse practitioner, Anusha Dahanayake. I visited both offices for appointments, the former for fraxel laser treatments and the latter for filler. At the time of my visits, both Dr. Sadeghi and Anusha commented on how congested, bumpy and irritated my skin looked. They both suggested I lay off the moisturizer or opt for something much lighter. My first reaction was shock and horror – “I can’t, my skin is so dry, tight, and irritated/sensitive. I need the heavy moisture.” To which they both replied, well, when you apply a lot of moisture, it tells your skin that it doesn’t need to make its own natural oil resulting in it becoming ever drier. A reasonable cause and effect relationship. I thought back to what we all learned from the era of Nozema, Clean & Clear, strip-your-skin-of-every-last-drop-of-oil phase, that removing moisture causes the skin to produce more oil, it did make sense that over hydrating it would cause it to produce less. Dr. Obagi’s ethos really resonated with me. I thought about the layers and layers of hydrating serums and moisturizers I have been using and realized I might be causing more harm than good, so I decided to give it a go and only cleanse, stimulate (exfoliate and stimulate collagen production) and wear SPF for a few weeks to see how my skin would respond. I opted to not buy Dr. Obagi’s skincare line, which is rather pricey, but thought I would give it a try for a few weeks with products I already have. I tried cleansing in the morning, but the Jan Marini cleanser is so strong that my skin turned a little pink. Also, my best friend, who does almost nothing to her face and has the most beautiful skin, told me she just applies SPF in the morning, so I decided to try this low-maintenance morning routine. Low and behold, it worked for me. This week I alternated between the Whal Myung Antioxidant Serum and the Kerstin Florian Vitamin C Ampoule which is a very strong vitamin C serum recommended to be used every other night. Week 2: The second week felt like a rebirth. After seven days of waking up to dry, flaky skin, my skin started to level out. It was as though a thick layer of dead skin was finally allowed to slough off. This week I started to rotate in Jan Marini BioClear Lotion. So one night would be the Whal Myung, the next the Kerstin Florian and the third night the Jan Marini. Then I would cycle through them again. Instead of applying all three in one night, like I normally would and create a lengthy routine, I stuck to applying only one per night. Though serums aren’t hydrating like moisturizers, they do contain a little bit of liquid that’s nourishing the skin and I wondered if the ten-step crazy routine we’ve all gone crazy for has been contributing to over hydrating. Week 3: During this week my skin started to become really smooth. My forehead began to take on a sheen reflecting light, as did my cheeks. My nose and chin started to get a slight shine as each morning I noticed subtly more oil than the night before. My skin overall started to appear dewy, shiny and glowing. 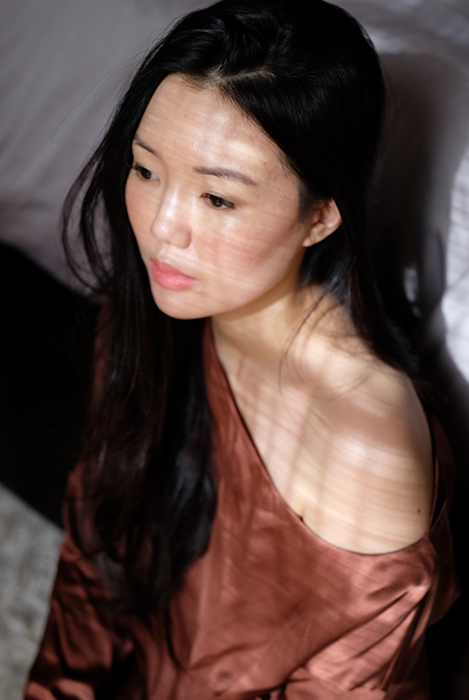 When I was in my youth, I was perpetually trying to blot and powder away any shine on my face, but now I realize that this shine is what makes skin look dewy and youthful. Week 4: I’m now entering week four and my skin looks healthy. It looks younger, brighter and clear. The congested bumps on my forehead are gone. My cheeks are shiny and smooth. There is a bit of dryness right around my lips, but I think that’s from the glycolic cleanser that touches my outer lip line. What I notice most is the light my skin reflects. I have a glowing appearance. My t-zone has started to become more oily, which I don’t mind, and the best part is that my perioral dermatitis has improved. The residual redness around my nostrils and chin seems to be slowly fading which I attribute partially to the (1) the Jan Marini BioClear Lotion which contains anti-inflammatory and brightening azealic acid and (2) the fact that my skin is producing its own natural oils to hydrate itself and (3) easily able to slough off on its own and with the help of the glycolic wash. Overall, my skin glows and it feels so healthy. It feels like it can breathe again. And it feels strong. There’s no irritation when I wear makeup every day and it feels balanced. Will I continue this forever? Probably not. I definitely think that there is a time and place for moisturizer, but it’s been a good lesson for me to pare back how many items I layer on my skin and the importance of healthy stimulation/exfoliation of the skin. I’m so happy to be back using acids! I’m curious if anyone else has tried forgoing moisturizer. I’d love to hear about your experiences in the comments below or if this is something you might try yourself!